Guy Verhofstadt, the chief Brexit negotiator for the European Parliament, has suggested that the number of MEPs representing Ireland should be increased from eleven to fourteen, incorporating the three seats currently allocated to the constituency covering the British-administered Six Counties. The apparent aim is to ensure the continued representation of Irish and European Union citizens resident in the disputed region at Strasbourg and Brussels. It’s certainly an innovative idea and one with much logic and merit behind it. However one cannot imagine the United Kingdom greeting it with any great enthusiasm, given its post-referendum swing to isolationism. Likewise, Dublin may find it difficult to swallow for its own party political reasons, considering the likely beneficiary would be Sinn Féin. Unionists would almost certainly boycott any future election for the EU legislature, and the logistics of it, let alone the threats from British separatist violence, would seem to make it a nonstarter. All that said, following Britain’s eventual exit from Europe the inhabitants of the Six Counties will suddenly find themselves in a unique position, forming the largest community of EU citizens legally resident and indigenous to a region technically outside of the European Union’s borders. They will continue to be dual nationals of Ireland, the EU and the United Kingdom by virtue of international treaties between the former and latter parties. Which will certainly persuade someone somewhere to mount a legal challenge to any exclusion of their representation from the parliament in Strasbourg. Fun times ahead. read somewhere that leinster house doesn’t like this idea at all!!! I’d say so. A unionist boycott would hand three MEPs to Sinn Féin. DUP kicking up about it also. Jeffrey Donaldson very upset, stuff about ‘endangering the GFA’ etc. Which is ironic given the DUP/Tory lash up. Makes perfect sense – excellent idea. Brexit is opening up some extremely interesting avenues to be fully explored re the north-eastern part of the country – currently under UK administration – where we have hundreds of thousands of our own Irish citizens and jointly EU citizens. Even when Ireland reunites it won’t matter. Ireland will still be a colony of the undemocratic EU. No worries – Unionists have nothing to fear in the inevitable Re-United Ireland. 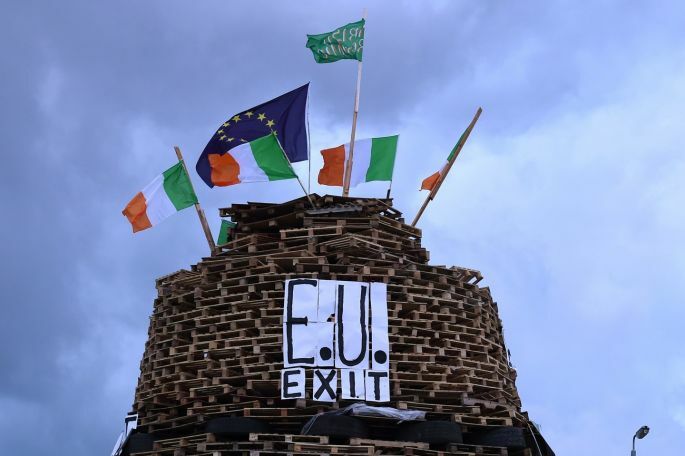 In fact, the biggest threat to Unionists in a Re-United Ireland will be Unionist bonfires on the night of 11th July. The North already has special status – the UK-administered area has a mechanism already in place thanks to the GFA and the EU whereby it has automatic re-entry to the EU by way of a vote to do so. Britain tried to prevent this – but failed to do so. Moreover, thanks to the Irish Constitution, the GFA and the EU, people born in the North have Irish – and EU – citizenship as a birthright. Finchley – nor anywhere else in the UK – does not have EU citizenship as a birthright. Paradoxically, a “harder” border in Ireland will only serve to further undermine the Northern statelet as Nationalists will see re-unification as the best way to completely remove the border – a border that had been already largely removed by EU membership up to now. Indeed, it could well be argued that the North’s status quo within the EU had become a comfort zone for Nationalists – that will no longer be the case from 2019 onwards. Moreover, it may well be the case as Brexit delivers even more economic hardship on the North, that some in the Unionist community, particularly the younger generation, may see membership of the EU as the best way of securing their future prospects and well-being and in bringing much-needed investment and jobs to the North. Let us be reminded that the majority of people in the North voted to REMAIN in the EU – including a significant percentage of Unionists. With a game-changing Nationalist ELECTORAL majority coming down the line by the mid-2020’s, there are very definitely interesting times ahead. Sounds plausible to me. The German parliamentarians were apparently fairly blunt in their appraisal of the British this week in discussions with their Irish counterparts. No love lost there.